funding, white papers, training workshops, and other approaches. provide resources (e.g., information repositories, training modules). Funding programs should support research on the effectiveness of science teams and larger groups, which will require community effort (e.g., new topics and new research methods). The ideas and recommendations in the report led me to consider the role of team science and single-Principal Investigator (PI) science in light of how BIO-funded researchers can contribute to understanding the rules of life. As a neuroscientist, I “grew up” in a world of single-PIs, but the next generation in neuroscience–my postdocs and grad students–are all part of big team science, in part due to the sheer complexity of the problem of understanding the brain. Thinking across biology, however, we see a more diverse picture. Though there are pieces of understanding the rules of life that require a team approach–for instance, when mapping out the wiring diagram of the brain (the connectome)–there are many problems that are beautifully amenable to single-PI science. For example, individual researchers may work toward understanding and enhancing photosynthesis, or sequencing Archaea from deep in the ocean to investigate the evolution of eukaryotic cells. 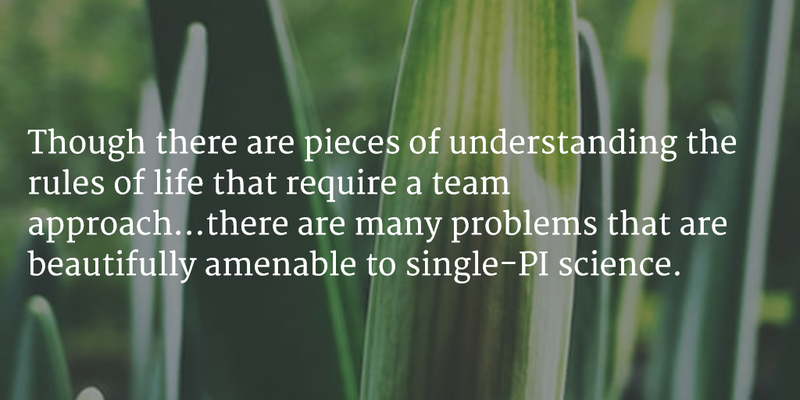 Other projects may be a hybrid state of affairs between single-PI research and team science. I think that there has always been a healthy balance at NSF between our experience and excellence in running big team science programs, facilities, and centers and our commitment across the Foundation to the Core Programs and single-PI research, and this serves the Foundation well. Some areas of research, like neuroscience, may be existence proofs for the effectiveness of team science; however, it is worth examining the science of team science within the various disciplines and sub-disciplines that contribute to our understanding of the rules of life.